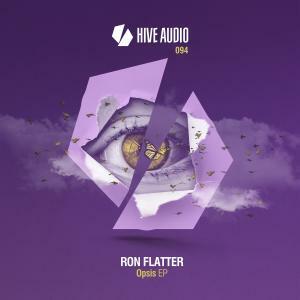 Born and raised in Halle/Saale, DJ and producer Ron Flatter as the first Hive Audio release for 2k19 is the „Opsis EP“, a three track piece brought to us by a man who's been around for more than 15 years now. With two albums on Pour La Vie Records and countless singles on imprints like Nitegrooves, Katermukke, Traum Schallplatten and many others under his belt it's pretty obvious that you've been dancing to some of his tunes in the past and so you will to his latest musical creations. Opening with „Phanta“ we see Ron Flatter provide a deep, well hypnotic take on TechHouse leading into overwhelming waves of panoramic joy implied by carefully arranged, touching string arrangements, a large scale breakdown and dramaturgy that clearly is schooled by Classical arrangements and harmonic interplays despite being relatively stripped down. The follow up is „Sweetwater“, a tune going into a similar, yet different territory whilst meandering in between deep TechHouse and latenight (Neo)Trance, once again bringing in big string sections, this time alongside a lively, tripped out motor city vibe and a distinct main motif for a mental takeoff in peak time situations. Finally the title track „Opsis“ indulges in warm, comfy and all embracing melancholia based on beautiful analogue bassline modulations, carefully twisted wobbles and a tender, caressing vibe for colourful sunsets on the dancefloor, best experienced alongside a loved one. Sweetness.